The world turned upside down when 3.1 came online. People bought glyphs like there was no tomorrow. I expected some rush. But I definitely did not expect my carefully posted glyph pack to be sold by 4 PM. I even less expected to sell glyphs faster than I could craft them. And above all, I never expected my deposit of full bags of ink to be depleted by the evening. There was a huge hype about dual specs. Everyone were talking about it. And the crowd around the trainers show that they expected it. Then how on Earth they did not buy the proper glyphs? I could make the decision to list my glyphs at 50-60G. Maybe I could sell them for insane profits. Maybe no one would buy them and I end up unsold deposits after the rush, that remain unsellable. So I choose to play safe and sold my glyphs for slightly above the normal price: 15-25G. That's a nice profit on each glyph. I really don't know when will this rush end. Maybe tonight, maybe it takes a week. Those who speculate well can even control the market, especially if the AH runs out of inks/herbs. Those who speculate badly end up with bad losses. There are no oracles in such situations, you'll have to make your own call. As I told, I played safe. Maybe that will mean after a week: "I made 20K instead of 50K". Maybe it means "I made 20K instead of 5K". Time will tell. Update: I asked "Why do other inscribes are missing out on this great opportunity?" Yoco gave the answer: they don't. In his comment he wrotes that he (on the same server as me) is also selling a lot. So what I considered "insane" was actually a situation under control by several mass producers. The servers that lack glyph industrialists went really insane like 100G/glyph prices or empty AH according to commenters. Never underestimate the stupidity of the people! I can easily run out of ink if the rush continues at the weekend. Several servers already dry. PS2: it seems that I was right to only mass-produce but don't raise prices. If I would raise, Yoco would be rich and I would feel funny. First time I loged in all my posted 48h glyphs where sold. After putting up new stacks I decided to hold on all glyph below 40g to save on my supply of ink. Made around 3k on the 50G+ glyphs last night. Back to posting all glyphs today. The new glyphs from trainer still sell for 90g on my server. Think I made around 8k total yesterday. Exact same trend on my server. Popular glyphs were sold out, I put them at ridiculous prices (10x markup) and they sold too. Unbelievable. Glad to know this is a game-wide trend. I was somewhat surprised on how it played out as well. I play on two realms and have a high level scribe on both. On my main realm (Arathor EU - the same as Gevlon's) my gold reserves look they are sufficient, so I didn't try to go milk out the situation. On the other realm I could use a little extra coin, but I didn't want to go all out - just eraning a little extra gold reserve. I wasn't prepared for the market to go nuts. And it was highly interesting to see how the two realms acted different. On Arathor the prices rose slightly, and the volume was higher than usual. As said, I didn't put much effort there. On my alliance realm on the other hand all fuses blew ... Glyphs that normally sell just above 10g went for 40-50g as hot cookies. The new trainer glyphs went for around 100g at first (Dark Death in particular). As somewhat expected, the most popular ink (ethereal - the outland herb one) ran out first, but at least I saw what was happening and priced those last glyphs at a price I was sure that they would not sell, to sell them at a more reasonable price in a few days - they are all gone now. In short, on I made more on my alliance realm per hour than normally per week. After spending there three hours I came back to Arathor and was slightly surprised that the market didn't go as mad there. As far as I can see, Gevlon, me, and the other glyph moguls there didn't dare to raise the prices to the same levels I saw on the other realm. The glyph I sold most there (those mages sure don't like to buy feathers ...), was stil going below 20g on Arathor, with plenty of supply from differnt vendors. "And why do other inscribes are missing on this great opportunity?" Would probably better read as "And why are other scribes missing out on this great opportunity?" Personally, I make glyphs pretty regularly, and 1k gold per day is a lot for me, but not unheard of. I actually put up all of my glyphs on monday afternoon (all priced between 12-20 gold) before I heard that 3.1 was confirmed to be coming out, and I still easily made 10k since then. I'm happy with the almost 40k that's in my personal guildbank (enough to buy my remaining future alts their epic flying skill) so I'm not going to worry about making more glyphs until the market stabilizes a bit. I wasn't not prepared at all and am definitely running into ink issues. I figure I made somewhere in the neighborhood of 10 to 15k gold in the first 24 hours just off of glyphs. Some glyphs sell for slightly more than normal just at a much faster rate but a few that were sold like mad I helped drive the price up to 3 or 4 times what it was before the patch. I can't wait to get my hands on some of the books to learn the other new glyphs. There was one other source of glyph purchasers. There seems to be a bug where some people appear to lose the glyphs on the current spec. When I logged on Tuesday, my glyphs were all missing. I was futzing with broken add ons and trying to list auctions without auctioneer, so I decided to wait for today and buy them. I log on today, and my glyphs are back! Let's hope this rush keeps up for a while, because after that there won't be as much of a demand for glyphs anymore. Another thing I noticed is that some of the old big time sellers of glyphs are missing, they only sell ink now. 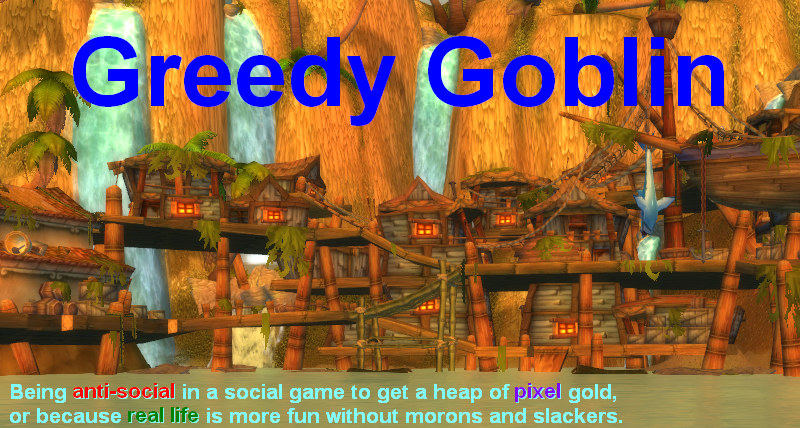 I found it a real shame that I didn't have an inscriber yet on Silvermoon (EU). Glyphs there were going for 60g+ at the end of the evening... And for some it was totally sold out. But yeh, question now is how long this madness will continue. Well, on the other side... I was too prepared. I posted ~2600 glyphs on my former server and about ~4200 on the one I currently play. Tonight it will take 3h to repost all glyphs :S I'm in fear of having to eat most of the glyphs with chip potatoes. Jesus christ on a stick. I had a 2000 ink stock pile. Glyphs were slowing down a lot on my server pre-patch (on the order of around 200 inks used per day). I ran out by the end of day one. I literally took the day off from my classes and had to spend all day milling up herbs just to keep up with the demand. I never thought I'd be so hindered by how long it takes to make glyphs. And posting them... /shudder. Thankfully, my server has at least one group of asian farmers (literally asian farmers) that can keep up with my voracious appetite for herbs. I don't know what I'd do without them. I personally saw this trend on US-Eonar. My lack of RL cash made me miss out on the horde side of the fence (my Horde scribe is on a different account), but within the first hour I made more cash than I normally do a week. By the time I had listed all my glyphs, I had sold literally half of them. I too ran out of ink - almost everything below Northrend ink - re-stocking the AH later that night. Ethereal and Shimmering ink products were the highest markups. My friend, who actually got me into inscription, fared just as well, matching my early prices with higher quantities (full stacks vs my 5-10 stacks). Most of his glyphs sold. Enchanting materials, while a bit slower, still sold quite a few; about 3 days worth in 12 hours. 36 hour damage assessment: Roughly 5500 gold for about 3 hours worth of work. On my server it was much different supplies sorrowed and prices dropped everyone tried to cut each others throat that it made the market perfect for the buyer. Same as the others. Though I did see some curious behavior from buyers that were buying my glyphs at 35g and then reselling them at 80g (which appeared to be the price most were selling at). Consistently I replaced those particular glyphs, only to be bought by the same group of people and then later resold. Though I wonder if I "missed the boat", I was able to at least pay for dual-specs on all my characters and then some. Yep it was insane, 10K profit in the first 6 hours after the server came up. The long downtime helped this immensely by clearing out the AH and allowing very high starting prices (100g), not to mention the fact that I had the new trainable glyphs all to my lonesome for a good majority of this time. Went to bed last night around 25K profit since 3.1 hit. I dont foresee this lasting much longer, glyph prices have normalized, and seeing demand starting to drop off. Medium size server, only a handful of regular inscriptionist. I thought I was prepared. I've been tracking glyph sales for about a month to identify what I thought my top sellers would be and had a few hundred up for 48 hours the night before the patch. In addition, I had hundreds of ink banked. Then I went into Ulduar with my guild the night 3.1 went live and there were instance server problems. My scribe ended up trapped inside until the following morning and I was unable to replenish after my initial inventory sold through. I made about 10K in the last day and a half, but would have easily made twice that if not for getting trapped in Ulduar. Its a good time to be a scribe. I'm glad I stocked up on ink in advance, NR herbs are going for triple their usual sell price since patch. I'm still struggling to understand what is going on on my server. I see the same glyph listed on the AH with prices ranging from 1 gold to 50 gold. Was the 50 gold guy there first, and got undercut in huge steps? Or were the cheap glyphs there first, and somebody counted on them running out soon and posted for higher prices? I can understand undercutting by 5 silver to get on top of the list, but why would somebody undercut his competition by half in a market that isn't going to last? Do not discount the weekend warriors. Those M&S who logon Friday to Sunday will be wanting glyphs as well... although it may take them until Saturday to discover how to dual-spec. I have sold over 800glyphs in 3days while progression raiding, with 4-5 businessmen trying to keep up. There are many opportunists. 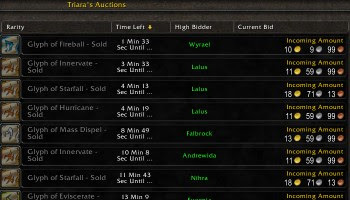 Since glyphs are not a market I know well, went into it tepidly, buying a few score glyphs auctioneer marked as cheap. Spiritual Attunement glyphs went almost instantly. Wish I had more of those. But all 3 Circle of Healings are still stubbornly sitting unsold. Strangely, no JC's on my server have posted the new cuts yet. Hoping to get some mileage there. @Tobold: The things you mentioned could well contribute. I'll bet another part of it is what I refer to as "Auctioneer Robots". Rather than take into account market conditions, these players just dump stuff on the AH for whatever Auctioneer tells them to. The "market price" varies widely between these players due to minimal scan history. Another factor is the "quick buck" people, who figure posting stuff for half the price of the competition is a good idea to get quick sales. ...and upwards to 200g and even 250g for the new glyphs on my server Al'Akir (eu). Pure sick if you ask me! My server, Aerie Peak, is pretty unfriendly as far as being overpopulated so there's lots of competition and prices are usually kept pretty low. I made 500g in the first fifteen minutes after I logged on yesterday. Glyphs that last week were worth 20s were now selling for 40g. I'm not even a very high level scribe yet (280 at the beginning of the night, 315 by the end). Consequently, I threw leveling to the winds and went herb farming.... Everyone else apparently had the same idea, there was barely an herb to be seen in all the old world. Outland fared a little better. I wished I could have stayed up all night just to take advantage of the glyph rush. I was caught of guard by the patch launching this week, for some reason I assumed it would be next week and I didn't stock any extra inks above what I normally would. I did however get lucky and find a ton of herbs still on the market for cheap, probably because I got on my server, and was buying herbs, within an hour of it coming back online. I was buying some herbs for 30-40 silver, then turning around and selling glyphs from them for 30-40 gold. Most of my glyphs I posted for normal to just above normal prices, 20-25 gold or so, but I found several that were selling for 30-40 gold each, and faster then I could make them. I was also pleased to see a glyph seller on my server who likes to use extreme undercutting (sometimes posting his glyphs for less then half of the previous auctions) either didn't post Tuesday, or his glyphs sold so fast they didn't drag the prices down at all. Im not on the same level as a lot of the people who post here, but I am still rather pleased with 2-3 hours so far spent to make about 3K gold, not counting what I am going to sell before I get home tonight. I made about 10k on Teusday and 10k on Wednesday. 4k today so far (it's nearly noon now). All from glyphs. I keep about 700 glyphs active at any one time, and I still have a good stockpile of inks in the bank. I wish my server was behaving the same way, unfortunately there's 5-6 of us who are all competing for the glyph market (used to only be 3 but it looks like a couple more popped up for the patch) which is keeping the prices down. I tried listing a set of glyphs at stupid prices (50g+) but was quickly undercut. Even so, glyphs that sold for 8-12g are now going for 20-25g which isn't bad at all, just not as great as selling them at 100g. Another trend I'm noticing is people dumping their banks to pay for dual spec. You'd think they would have been prepared, but I'm seeing frozen orbs, arctic fur, tailor cooldown cloths, etc for prices at record lows. I'm still expecting these items to all peak once the new patterns hit town so I'm buying up as much as I can while the prices are good. Anyone else seeing similar behavior on their servers? Horrible idea to buy the frozen orbs. They've been replaced by runic orbs, most likely the prices that you're buying them at will stay that low or actually drop in price. Didn't create any extra but dumped the thousand glyphs that were still in my bank on the ah for 17 a 20g. And one was selling each minute yesterday evening. Might I makem ore profit by putting them at 30g? Maybe. Maybe not but I'm making a nice profit and my bank is emptying. In any case, I'll make extra of the most popuplar this evening and list them a bit higher. Buy enough frozen orbs to make the Titansteel Spellblade. I bought 4 Frozen Orbs at the lowest price I've seen them ever to make a few spellblades to see how much people are buying them. I posted 2k glyphs (half the market) for 49g each. Sold 250 in the first 6 hours for about 12k profit. The market has firmed up markedly but I'm relisting them all at the same price now in the hope that the server runs out of ink before the weekend players and those who had patch trouble hit. I had a different experience: I had camped the DMF last week and gotten tons of inks for almost nothing. I had bought herbs/inks for weeks. I ended up with over 1000 ink and I crafted over 1000 popular glyphs. My scribe had leveled up just a week before, so he had only 7-8 discovered majors/minors, which hurt a lot. I liquidated 6000g worth of glyphs in the frenzy, and did not run out, but people were massively undercutting to the point where I didn't bother posting a lot of them: at 2g/glyph I wasn't going to trade in 2 snowfall for 2 jadefire to undercut. Two days later, the only market left seems to be for the newly-discovered glyphs. Nuture was found yesterday and the guy paid 2k for the book of glyph mastery; the glyph itself is posted at 500g/ea. Not sure if they're moving. Anyway, I cleared over 10k on patch day, 6k of that in glyphs. Now watching for other reactions in the market... currently prices are DOWN from pre-patch. Perhaps ppl are liquidating to get the 1k they need for dual-spec or raid consumables. Obviously runic orbs are going to go for high prices, but frozen orbs are still needed for spellthread and leg armor, which every raider / pvper is going to need. Once the new season hits and enough guilds are clearing a good portion of ulduar I expect another run on the enchants and the mats used to make them. They're also used in the titansteel series, but I'm wary to enter that market because of the mass amount of people able to craft them, too much competition for low demand. quick question. I was lucky enough to get my hands on a book of glyph mastery and it seems im the only one whos able to craft is at the time. Im posting it for 65/85 right now, do you guys think i could charge more? I paid over 2k for a book because it was the first I had seen on my server and not one new glyph has shown up. I didn't learn a very good one but I just got glyph of nourish from a second so I will be curious as to how it sells. So far I've bought 5 books for a total of 3k g. A bit on the expensive side, especially because I was moron enough to buy the first one for 1k3. I've planned to break even after 10 glyhps of each, so I'm pricing them between 90 and 120g. 3 of each I post at the low price, and 7 at the high one, in order to create a sensation of urgency in the buyers. One notable exception: glyph of explosive shot, sold 5 for 172g a piece. I made sure I had over a thousand Ink of the Sea ready to go but that hasn't been my issue today. Ethereal Ink is my problem. Between the Death Strike and Raise Dead glyphs, my stock has dwindled and I'm having to *gasp* farm Outland already. Be aware that there are some herbs that many scribes don't look for on the AH and can come cheaper. Mana Thistle and Ancient Lichen. Look for all of them. I'm running low on Shimmering Ink as well (because of the two new DK glyphs that use them) but I'm also noticing that I'm the only one selling many glyphs because my competitors weren't prepared and I'm the only one that has stock. I'm one of the lucky ones that has made a real killing. I'm just about at 30K since Tuesday night. I play on a german server and have to say that there is no hype as described by you. Although I sold a lot of glyphs, a lot of them came back and there are still plenty of glyphs available in the AH which are at normal price or even lower. So alltogether until now it was worth it, because I bought them cheap last week and sold them for normal price, but not a real hype here... Prices stayed stable. Jack: Just trade ink of the sea for the lesser inks. It's not that big of a deal. More and more books appearing on my server, current low is 2200 bid (no buyout), high is 6k buyout. I'm very hesitant to pay that price because it seems so risky. At the rate books are appearing it seems like after this weekend there will be quite a bit more competition over the 3.1 glyphs, and much reduced demand. Some them are currently going for 200-300g on my server. i ran out of ink by the end of wed. i wish i had bought more, i had a full 1000 northrend ink, and about 500 between the lower ones, notebly most from shimmering and etheral. i refuse to buy any herb that is more expensive than northrend herbs, i generaly can pick northrend ones up for 1.2 or less each, and useualy can find them in the 85-90silver range. the markets have realy slowed down now, but i can still make a reasonable 1k a day. but volume is way down, some glyphs are just still selling for more. this means the market is really gona tank with in the next few days. Glyphs have been my main stay for months now. i wish i had been more proactive about getting my reserves up (gold wise) but i got lazy when ever i had around 5k. regardless, i have easily made about 15-20k since patch day. i have also had crap luck with those books. i managed to snag 2 for 700, and one was given to me by a random player who was hoping i would learn the glyph the wanted. all 3 yeilded horrible glyphs though. now people are trying to sell them for 3k (have yet to hear of any one actually getting that amount, M&S just think they can gouge for that much)hoping to see some generated from with in guild soon. I was reasonably prepared, but ran empty of glyphs after 1 day. Herbed a lot in Scolazar, especially at non-peak times. Adder tongue is the best as it gives 50% icy pigment yield. I have over 60 snowfall inks from it now. Also I was lucky to get a Book of Glyphs for 100g some hours after patch release. I have been working full time at AH now, and cancelled all auctions that were underbid, and all the time produced new ones. Earned 8000 per day first , and now I have 22k more than release. yeah probably 90% of my glyphs got sold on patch day too. But it was a nice 7k net profit (as opposed to my normal 600-800g a day), thanks for the glyph insights on this blog Gevlon. It was a nice run while it lasted.